my pointless: giving new meaning to "fill er up"
Look at this car. 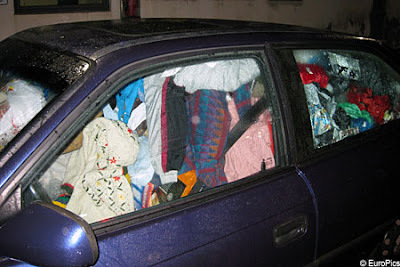 It is not simply a car filled with clothes, food, furniture and assorted junk. It was pulled off the road looking like this. This car was observed by police as it whizzed down a highway in Germany. It is so full of stuff that they could hardly see the driver. The woman has not been identified. However, she has been told that she can not drive again until she passes a tidiness test. I'll bet her cell phone is in there somewhere, too.